With top and bottom panels that open independently, these shutters will flood your room in natural light and keep your privacy intact. Julia Goodwin, editor at House Beautiful magazine picks her favourite shade from the House Beautiful painted shutters collection. Tier-on-tier shutters, sometimes referred to as double-hung shutters, are made up of two sets of independent shutters which fit to the top and bottom sections of your window. As well as giving you a stylish finish at the window, tier-on-tier shutters are versatile and practical, allowing you to make the most of sunny days, while also helping to maintain your privacy. Simply open the top half of your double-hung shutters, or throw both tiers wide when privacy is not a concern. At night, fully close your tier-on-tier shutters to block out light, help reduce noise levels and keep your room feeling cosy. And, of course, you can subtly adjust the louvres in both the top and bottom of your tier-on-tier shutters to allow the sun to gently illuminate your room. Choose from timber, craftwood and waterproof options, each available in natural wood and painted finishes. 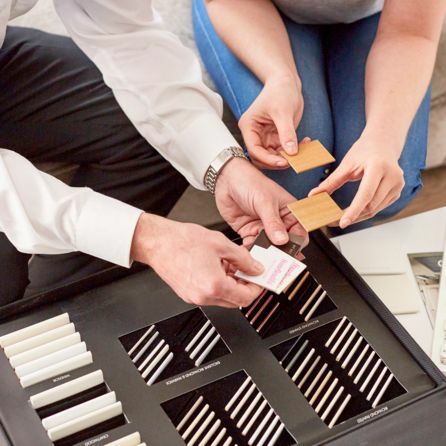 Browse our shutters range and get a better idea of which design is right for your home. Then book an in-home appointment with an advisor to find out more.